The Dreambaby Grooming Kit contains all the essentials for keeping a child well groomed and healthy. Including clear plastic case for easy storage and travel. 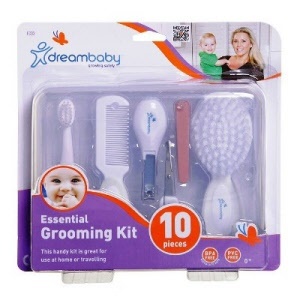 The Dreambaby Grooming Kit is packed with essential items to help keep your baby healthy, happy, and well-groomed! Including a hardcase storage container, it's so easy to keep the items organised, and it's perfect for travel. Hair Brush - Soft and gentle on the scalp and with an easy grip toddler-sized handle. Comb - non scratch, rounded teeth will help detangle hair without tears. 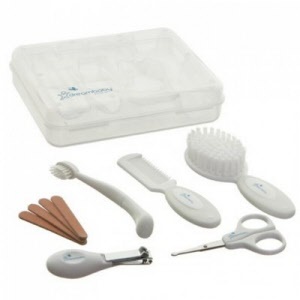 Toothbrush - compact head and soft bristles ensure great oral hygiene for developing teeth. Easy grip handle encourages correct brushing technique. Nail Clippers - Sized and curved for safer trimming of little finger and toe nails. Emery Boards (x4) - great to gently file away any sharp or jagged edges on little nails. Storage Case - strong, hard plastic construction.